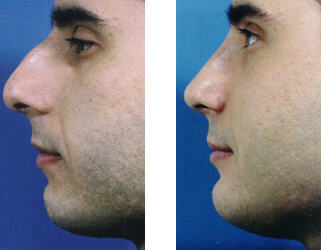 Nose surgery is also called rhinoplasty and is an operation that reshapes the nose. When the surgeon looks at the patient’s face and profile, he is looking for a proper balance of features. Dr. Colton’s goal is to reshape the nose in proportion to the rest of the face and body, and to achieve a graceful and aesthetically-pleasing overall result. 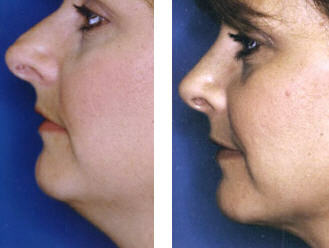 Often, rhinoplasty alone is not enough to enhance the profile, and chin augmentation is recommended to correct a receding chin. It is extremely important that the surgeon understand the patient’s request, and this is accomplished with careful detail at the time of consultation. The physician must convey to the patient what can reasonably and feasibly be accomplished. Bringing in pictures of noses you like or dislike is a helpful tool in illustrating the look that you are seeking. The end result not only depends on the surgeon’s skill, but also on a variety of physiological traits such as skin texture, anatomy, healing of scar tissue, etc.The risks for Rhinoplasty are minimal and will be discussed with you at the time of your consultation. The operation itself is done on an outpatient basis at one of the local hospital surgical centers. This means that you arrive at the hospital the morning of your surgery, have the surgery, and then return home later in the afternoon. The surgery may be done either under a general anesthetic, or local anesthesia with intravenous sedation. Both techniques are safe, and patients tolerate them very well. In most cases, the operation is done entirely through the nostrils. There are no skin incisions unless nostril narrowing is done. The skin is lifted off the framework of the nose. The bones and cartilage comprising this framework are then repositioned and remolded to create the desired result. Some sutures are placed inside the nose which dissolve by themselves. Following the surgery, a small plastic cast is placed on the nose and left in place for about a week. Occasionally, a nose needs to be increased in size. This may be done to some extent, and cartilage as well as other graft materials may have to be used. Grafts are often taken from the ear or from the inside of the nose. Certain artificial materials are also available. Most of the time, we prefer to use the body’s own tissue, although either can work adequately. The use of implants is always discussed in detail with the patient before surgery is done. 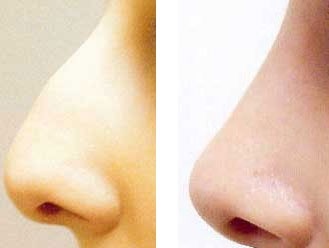 There is a piece of cartilage in the middle of the nose that separates the nose into two chambers. This is called the nasal septum. A deviated septum is when the nasal septum is dislodged or bent. This may cause obstruction of breathing, and correction of this problem at the time of nasal surgery may help the situation. There are also structures inside the nose which are called turbinates. The turbinates are part of the nose’s air conditioning system, and they naturally swell and contract as part of the normal nasal cycle. In some people, these are chronically large. At the time of nasal surgery, their size can be decreased, and this will enlarge the breathing passages and improve breathing. What to expect for your recovery? After the operation, it is normal to get some swelling and bruising to the sides of the nose and under the eyes. This will last for several days, but will gradually improve and usually disappear within a week’s time. Often, cold compresses on the eyelids and nose area and sleeping with the head elevated will help control the swelling. It is normal to be quite congested, and this clears up after a few days. Very little pain is usually experienced, but you might have some mild aching, much like a headache. You will be given prescriptions for pain pills, antibiotics, and sleeping pills for relief. The cast is removed about a week following surgery. There may be small amounts of bleeding in the postoperative period. It is normal for the nose to drain a slightly bloody discharge for the first 24 hrs. to 48 hrs. Shortly after the procedure, you may return to your normal routine. Heavy lifting and bending are not recommended. Certainly, you can be up and about, go outside, etc. You may wear glasses or sunglasses on top of the small plastic cast. The nasal bones will not be completely healed for approximately six weeks following the surgery. During that period, it is imperative not to let glasses rest on the bridge of the nose. These may be taped to the forehead, or small clips may be used underneath to keep the pressure off the nasal bones. We will supply you with a set of clips at the time of cast removal. Generally, a person may return to normal activities (including work) within 1-2 weeks following the surgery. When the cast comes off, the nose may be quite swollen. During the healing process and as the swelling decreases, the nose will continue to slightly change its shape. The swelling on the tip of the nose may take the longest to go down.